If you want to build from scratch, we can accommodate that. Our Plan set contains a 90+ page Manual with instructions and photos, a full size 3 foot by 8 foot printout of the forms, and a PowerPoint file with numerous step by step pictures. The Plan set is shipped in a 3 foot tube. To create the forms you buy a 4 x 8 sheet of . 5 mm plywood, (floor underlayment at Home Depot for ~ $11.00 works great) affix the paper layout to the plywood using spray adhesive, cut out with a saw and sand. Cutting out the forms will require 4-6 hours. Alternatively, you may purchase the CNC form set already cut. 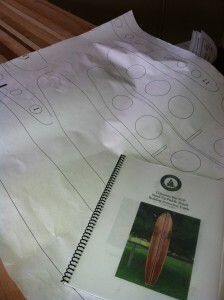 At Cedar Boat Works we use the “Study Plan Method” to make the job easier. The purpose of the study plan is show enough information about the hull shape to permit the potential builder to make a decision as to whether this is the boat he or she wants to build. Our plans also include all useful information such as strongback length, station distances, rocker information, saddle construction. They are easy to read and filled with lots of photos. Plans start at $100.00. Visit the shop to choose the right plans for your project.